The Primary Care Home (PCH) programme is delivering a range of benefits for patients, staff and the wider health system, according to a new report released today (Friday 31 March). 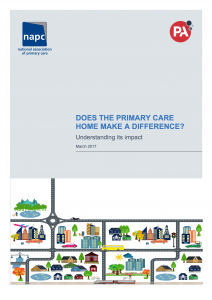 Commissioned by the National Association of Primary Care, the report Does the Primary Care Home Make a Difference? looked at the impact of three primary care home rapid test sites, covering a population of more than 110,000, and assessed how PCH could support the delivery of the 44 Sustainability and Transformation Plans (STPs) across England. NAPC President Dr James Kingsland said: “The rapid adoption and spread of PCH demonstrates that this is what our colleagues have always been looking to do – a vehicle to deliver change that’s quick to get up and running, empowering for staff and patients and realistic in that it grows from established list-based practice”. The new model brings together a range of health and social care professionals – from GP surgeries, community, mental health and acute trusts, social care and the voluntary sector – to focus on local health priorities and provide out of hospital care closer to patients’ homes. Next PostWelcome to the National Primary Care Awards 2017!